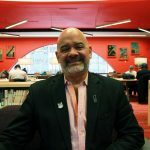 As the Director of Library Services, Michael Colford is responsible for the public facing service at the BPL, including Neighborhood Services, Youth Services, Reference & Research, Programming, Public Instruction, Literacy Services, Borrower Services, and the Kirstein Business Library & Innovation Center. He has been with the BPL since 2004, and has worked in public libraries since he was a high school page shelving books in the 1970s. Michael holds a Bachelor’s Degree in Marketing/Management, and a Graduate Degree in Library & Information Science.